It has taken some time, but we FINALLY have the garden in. This year we got it up to about 1/4 acre. 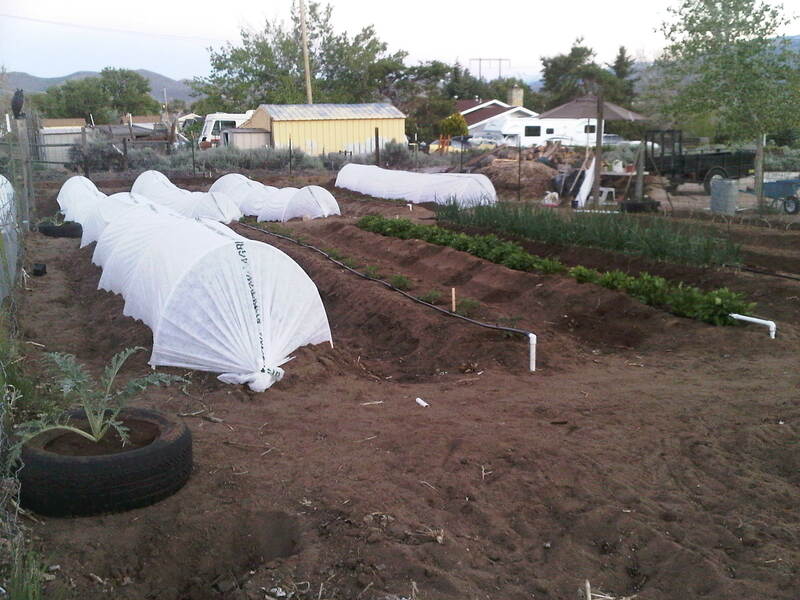 with a lot of effort, the trenches were dug, fences raised, irrigation put in and many many plants and seeds planted. This spring was not very conducive to getting plants in the ground and going. And, well, we’ve been a bit behind the 8-ball this year – again. But, despite all the excuses and justifiable delays, we got it in and things are actually doing amazing well. We have two full rows of tomatoes, a total of 28 tomato plants, a row of chard, beets, carrots and kale, a row of turnips, parsnips and rutabagas. A row of onions. A row of potatoes. A row of winter squash. A row of eggplant, cucumber, and cauliflower. A row of tomatillos. A row of peppers. A row of beans, strawberries, dill and cilantro. A row of beans and carrots. A row of pumpkin, winter squash and summer squash. We still have melon and gourds to get into the ground, which should happen this week. 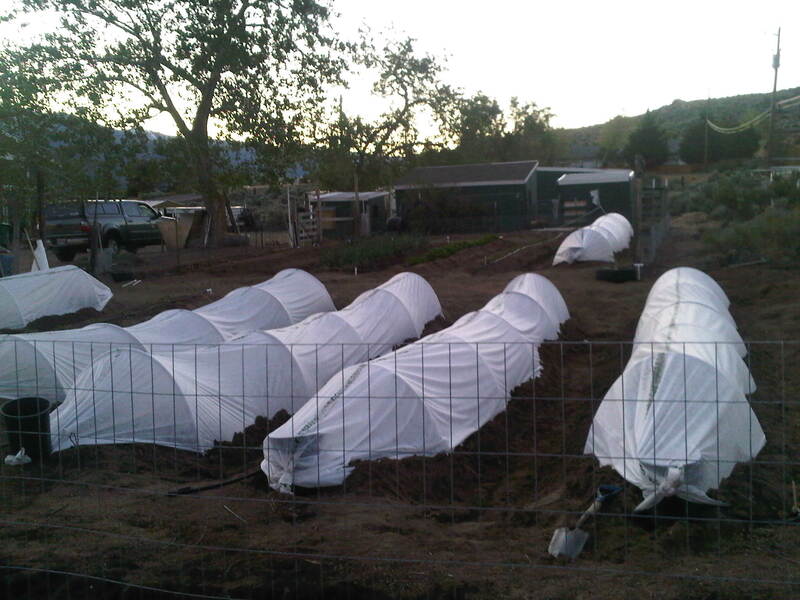 The biggest challenge was getting the row covers up in time. Just over a lunch break today, the birds got their sneaky beaks onto several of our freshly sprouted beans. Last year, our biggest nemises was birds and ants. This year, it still appears to be quail and ants. 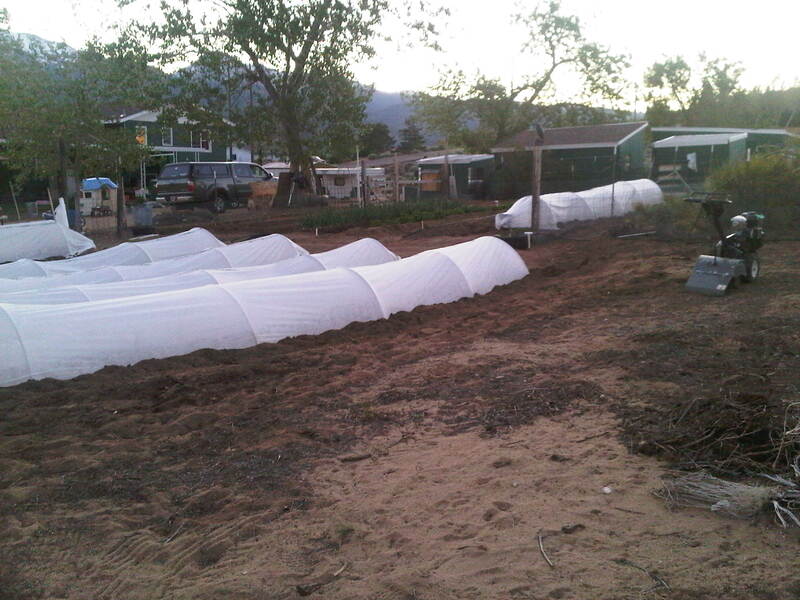 Row covers and bird netting will take care of the birds. Ants…well, today they got cornmeal to hopefully start taking care of the problem. We’ll get the buggers under control eventually. 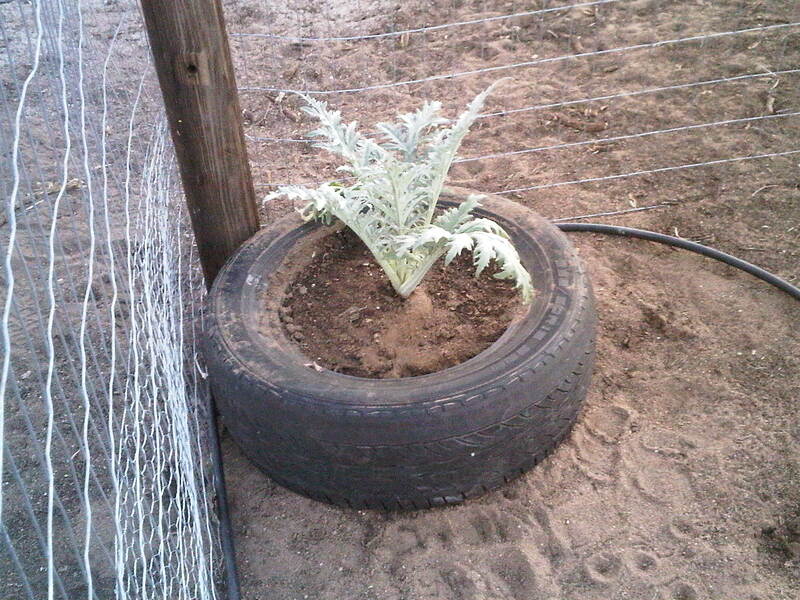 We also planted four artichoke in spare tires. Finally found some places that they can be planted without having to be moved in future years. We still have about 6 fruit trees and several berry bushes that need to be planted. Hopefully this week. But, we’re making steps. Now, I pray the garden produces. 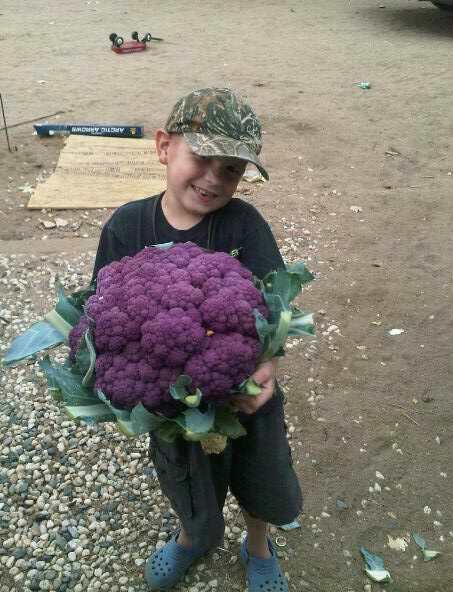 I can’t wait for harvest and canning season. It has come and gone, and truly, it was a pretty good weekend. I think we got a lot accomplished. But, looking back now, I’m not absolutely certain of that. Saturday Chet and our friend Scott went out and did a nice 17 mile (give or take) run on Peavine, Chet’s old stomping/running grounds in Reno. Truckee was able to accompany them, and his foot seems to be doing much better. He’s got a bum knee I guess is the best way to put it. But, he did great and none of the guys, Chet, Scott or Truckee were any worse for ware. Well, I assume Scott wasn’t, but I wasn’t there today to see how he was feeling. I felt like I got a bit accomplished yesterday. I got the kitchen cleaned up (amazing how quickly it can all be undone) and the house picked up a bit along with sewing a comforter cover for Rebeka. Ahh, yes, that time is upon us and we finally decided it was time to transition to the big girl bed. Rebeka’s been able to crawl out of her crib for a while already, but it was infrequent. She also has a very controlled manner of dropping out onto a nice carpeted floor. But, she was generally content to just chill in the mornings. But, this past week we were having more incidents of her climbing out coupled with one night her climbing out, leaving her bedroom, and being almost all the way down the stairs to the living room at around 2am. So, we decided it was time to move into the big girl bed. Our friends had given us their daughter’s old bed when she upgraded a while back, which we were extremely grateful for. So, yesterday after Chet’s run he stopped at my parents storage unit and picked up the bed. Today was the big transition day. 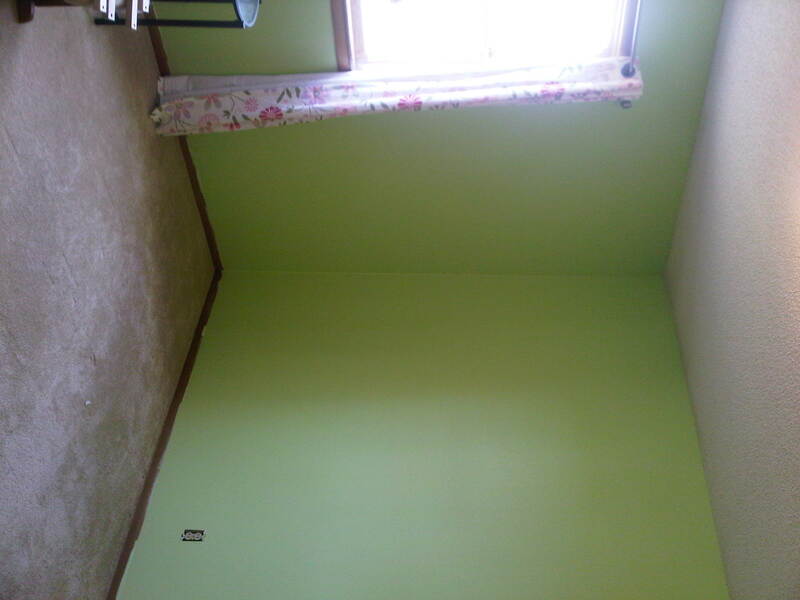 It started with totally repainting Rebeka’s bedroom a bright green color from a pale yellow color. Ultimately, we’ll replace the trim and I need to clean the carpet, but it’s MUCH better than it was. Got the room painted and redecorated before noon! Not too shabby. I am very happy with how it turned out. So, once I finish putting a hard coat on the switch plate covers and Chet replaces the sockets and switch, all we’ll have left (besides the trim) is artwork. 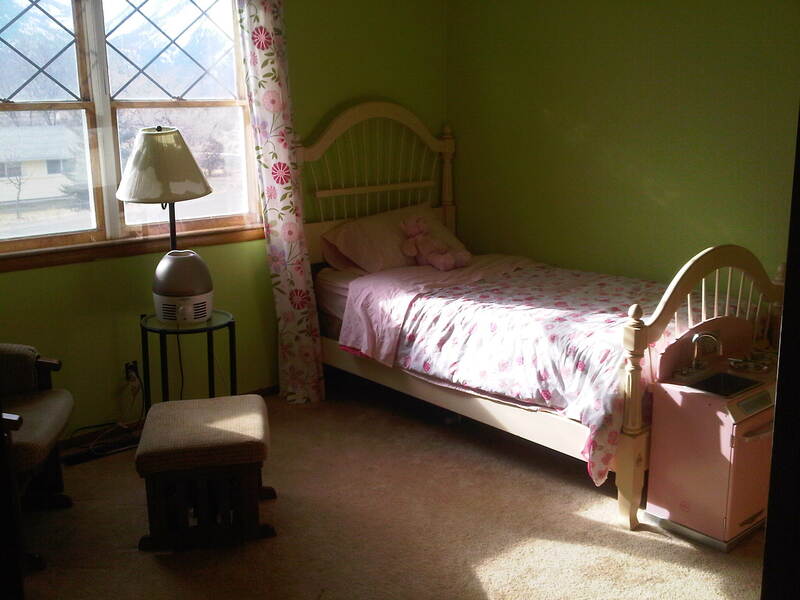 But, not a bad room for our little big girl now. 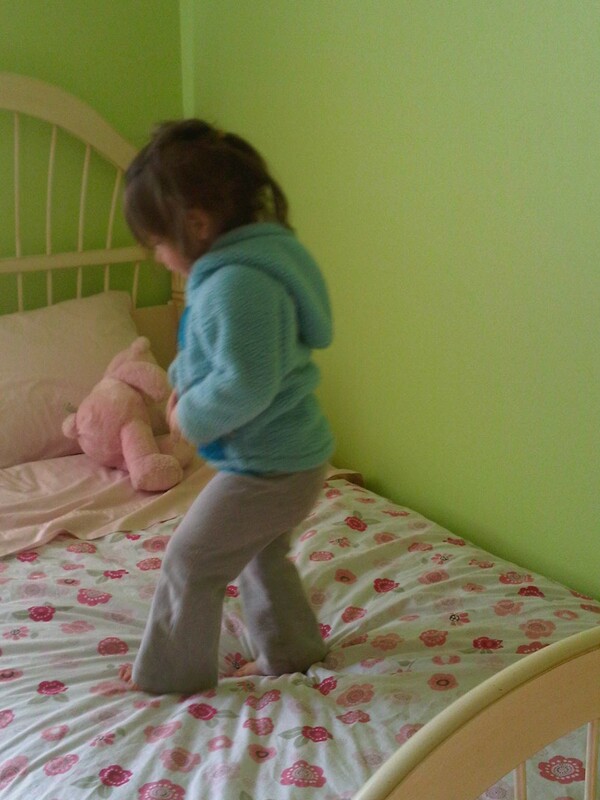 And of course, what’s the first thing you do when your 2 and you get a big kid bed….JUMP of course! After Chet and I got Rebeka’s room done, Chet headed out to restock our firewood stores near the house, since we might be getting some weather. 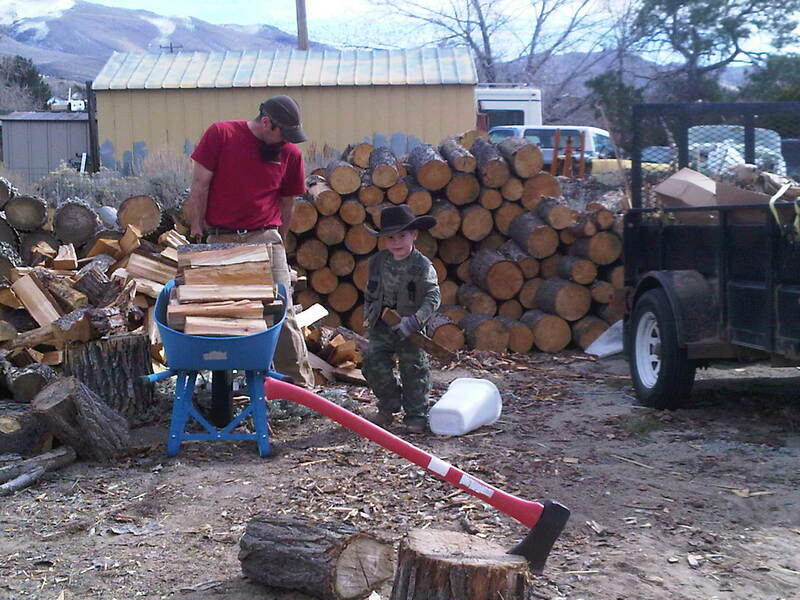 Gabriel worked hard with his dad helping him to stack firewood and moved a ton of kindling for us too. Not only did he move kindling, but he moved some of the smaller logs on his sled. He is such a hard worker. It was just awesome that he felt like hanging out with his dad in the yard today. All in all, it was a great day. I started this blog post a few months ago and never got it completed, until tonight. There’s a Gabriel update at the bottom, but when there’s not a lot of really juicy things to report on Gabriel, I figure I might as well keep up with some of the other aspects of our life. So, one thing Chet always wanted and I readily agreed to, was a wood fired cook stove. The idea is so incredibly practical – the power can go out, you can loose natural gas, and you still have a source of heat and a stove to cook your meals. 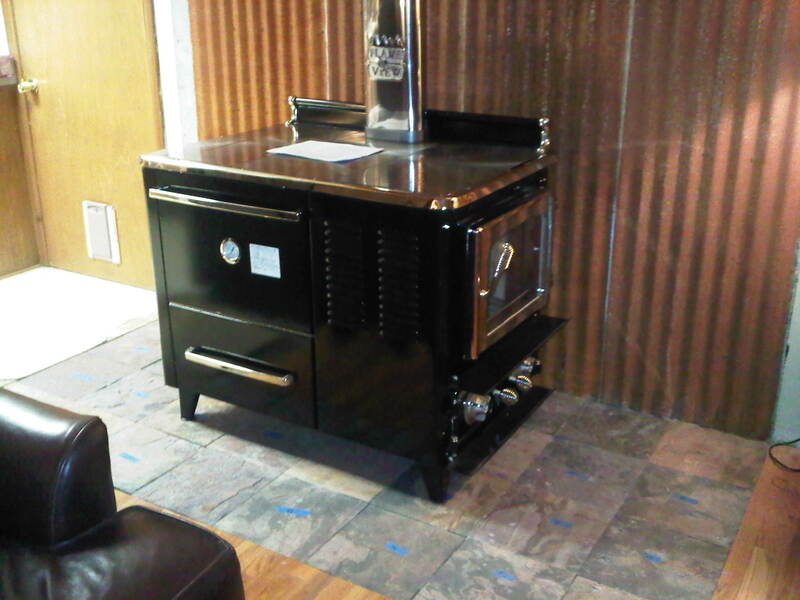 After much searching, Chet found an Amish made cook stove with a glass door on the fire box. And, we ordered it. About three months later our custom Margin stove arrived and with the help of a couple friends a lot of grunting, it was moved into place. So, we’ve had it and while it took a little getting used to, we have started to learn to use it and it is wonderful! Is it not beautiful? I think so. Our house did not have a wood stove in the living room when we purchased it . So, the process of preparing a space began. Chet started by tearing out the wall that went between the living room and kitchen. Unfortunately, I was out of town that whole weekend, so there are no photos to document his progress. We decided that we’re aiming for a late 1800’s mining camp feel for the new house, so with that in mind, Chet conceptualized rusted metal panels for the back of the wall and we eventually decided of slate for the hearth. I think it turned out nicely. The process was a bit of work. Chet cut out the wood floor where the hearth was to go (after taking out the wall). We then installed the cement board and then did the tile work using 12×12 slate tiles. The stove heats the house beautifully, and when we’ve got it cranking it will easily get the house up to 80 degrees. Oooh, how I love to be able to walk around the house in a t-shirt and no socks in the middle of winter entirely warm and comfortable. We’re still learning to cook on it and in it. Once things settle down again that is one of my priorities – I can’t wait to bake bread in the oven. But, until then we’ve cooked pies and various other things in it with good success. And, well, there just isn’t anything like a pot of beans cooked on the stove top. As for Gabriel, he has his next chemo treatment tomorrow here in Reno. This will be his last chemo treatment in the induction phase. This also means we are on the count down of prednisone and to his last bone marrow aspiration before moving into the consolidation phase of his treatment. It will be interesting meeting a new team of doctors tomorrow, and it’s absolutely awesome to be able to do the treatment locally. Okay, so I’m really enjoying sewing. Maybe it’s because my career is so left brain oriented that having a right brain outlet is really fun. And, it’s rather practical. I’m looking forward to making items for the kids. The Halloween costumes were a dive into the deep end and it’s a good thing. Anyway, I was inspired by JJ Heller’s Blog post to make a dress for Rebeka. My mom had handed down a polo shirt a while back – she said if I didn’t want it to pass it on to someone else. Well, I didn’t want it, so it’s been hanging in my closet for a few months. Well, after the inspiration from JJ Heller, I decided I could use that shirt to try to make something for Beka. Unfortunately, I didn’t take a picture of the shirt ahead of time. I really need to get better about that. Anyway, the shirt looked something like this. Photo from Tommy Hilfiger; Wide Stripe Polo Shirt can be found here. 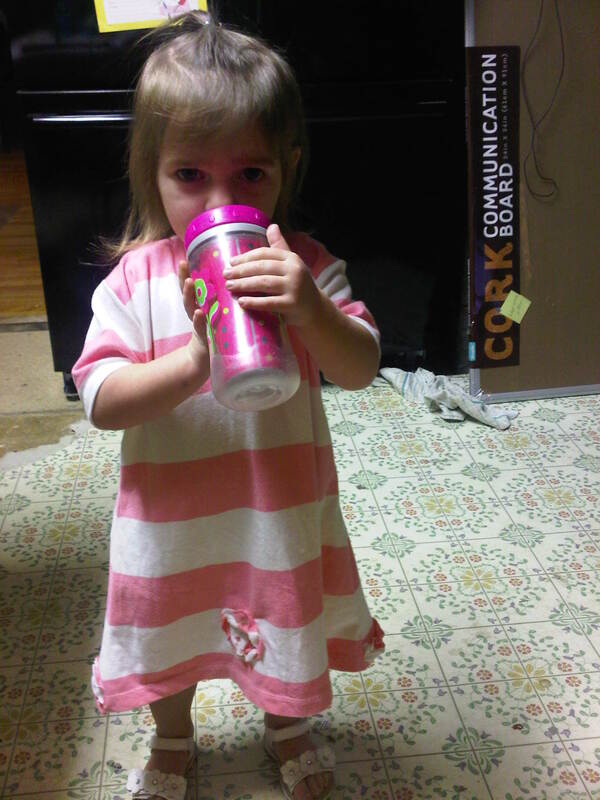 So I got busy and within an hour and half (with distractions) I ended up with an adorable dress for Beka. Not too bad for my first foray into just throwing something together. I used the sleeves from the shirt to make the sleeves on the dress – as I saw it, it was less hemming that I would be required to do. I also need to get a better picture of the front (sans sippy cup) because I used the buttoned front and incorporated it into the neckline. And, really, I have to say, it is fun. I’ll make changes in future designs, but I can’t wait to hit the thrift store and look for some more shirts to use for different outfits now. 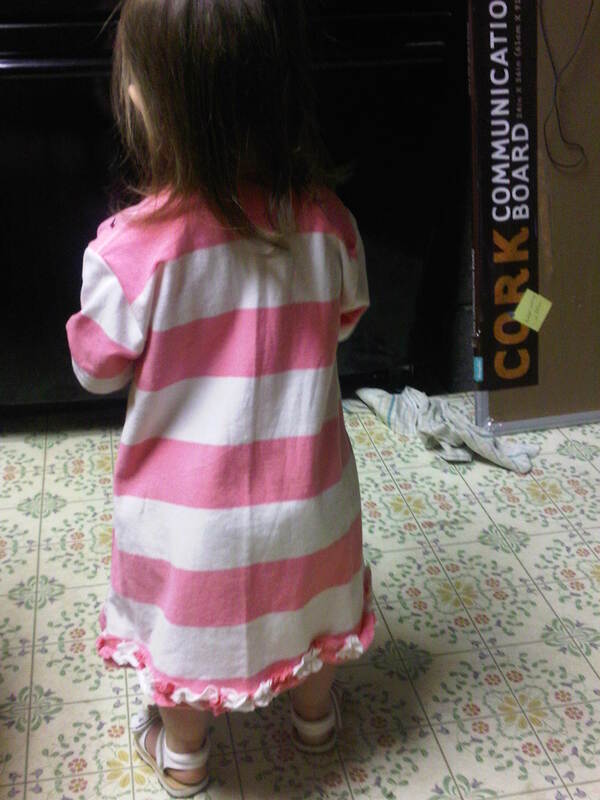 This morning I put Beka in the dress for school and realized she needed some bottoms (they have a good modesty policy at her preschool). And I remembered that Chet’s aunt Rachel gave us this ADORABLE diaper cover when she was born. So digging into the drawers I went searching, and VOILA! I found it! However at this point in time Beka was over having her picture taken. So, that’s the best I could do. So, I owe JJ Heller a big thanks for inspiring me to craft something for Beka and to Jessica from Happy Together for providing the basis to do put this together. We moved in early May and didn’t get our garden in until late May. Being in a new micro-climate combined with new “pests” made for an interesting first season. Our biggest enemy early on were quail, what a bunch of buggers. Nothing scares off those little sprout nipp’n birds. Second biggest enemy, ants. Man, they can wreak havoc like you wouldn’t believe. But, certain things did amazing this year. Especially our tomatillos. The winter squash were doing well until a hard freeze about 6 weeks back. Tomatoes were hardly worth the fertilizer used this year. Corn, did pretty well. Beans, pretty well. Given how busy we were, how late things got going, it was an interesting year. So, fast forward to today. We know we have freezes on the way, and we knew if we were to get what is left out in the garden preserved, we had to harvest this weekend. Yesterday was occupied with Chet going out and cutting two cords of wood and me with the kids transporting to a birthday party and trying to make Gabe’s Halloween costume in time for his piano recital today. So, today, while I was trying to finish Gabe’s Halloween costume and after we dropped a crock-pot full of homemade chili at the Silver State Striders Fall Colors Half-Marathon finish line, Chet ventured out to finish harvesting what he could from the garden. But, today was amazing weather wise. We’ve had hurricane force winds most of the day here at the house and have had a solid 10 hours of rain, and much of it of epic proportions. I joked today that perhaps Chet should be out building an ark not harvesting the garden. However, he was out there in the torrential storm harvesting peppers, tomotillos, potatoes and what not else. P.S. I got Gabe’s costume substantially completed just before we lost power. It was awesome. About two bushels of tomatillos, estimated about 80-100 lbs. of potatoes, half a 5 gallon pail of peppers (is that a peck? ), and several summer squash. Next up this week will be preserving all the harvest. We need to build some crates to store the potatoes in the basement/cellar. We’ll pressure can the tomotillos and I’ll probably process the peppers into more jelly. 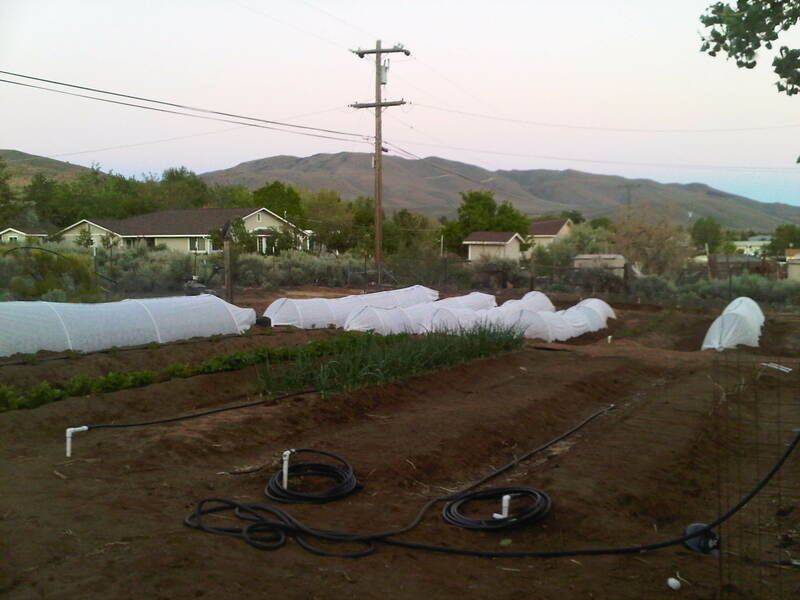 If we’re going to put the time and energy into a garden to rely upon to sustain the family to some degree, then you have to not let it go to waste. That means sending the husband out to harvest is the worst weather imaginable. Okay, seriously, I would have been out there with him if I hadn’t had to sew costumes, but I’m very appreciative of his hard work. Now comes the continued hard work of preservation, but it’s also very gratifying to see the fruits of your labor literally and figuratively. When the chicks arrived, Chet received a panicked phone call from the Post Office. He had missed the first one or two calls and our voicemail hasn’t been working correctly. 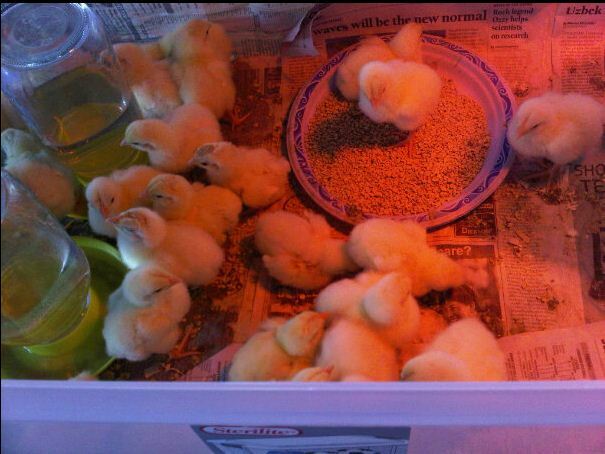 As Chet entered the Post Office he could hear the “peep peep peeps” of the box of chicks. As you can see, the chicks were all the same size. But, that quickly changed. Unfortunately, I didn’t photograph the progression. All in all, we only lost two baby chicks, one Rhode Island Red laying hen and one meat chicken. Chet got the coop built and the hen house arranged. Unfortunately, even though there is a good amount of room for the laying hens, it was and is cramped quarters for all the chickens. The laying hens are little buggers and began cannibalizing on the meat chickens by pecking at their feathers. So, we lost a few to cannibalization. Most of the time, Chet was there to “take care of business.” However, he was out of town for a week, and let’s just say, the cannibalization would have made a great scene for a slasher movies. Unfortunately, this poor chicken was still alive, and suffering. Our neighbors had been over (I asked them to give my car a jump) when this was discovered. I was asked what I was going to do. What choice did I have? I had to put the poor bird out of its misery, so I said to them “well, I have to kill it.” With that response, they couldn’t get out of there fast enough. Bless the heart of of our son, Gabe, as he wanted to be there with me. I needed him to not be there, for me, and I needed him to watch after his sister in the house while I to took care of things. I am proud to say that I am not longer afraid of breaking a chicken’s neck with my bare hands. Now, is it something that I want to do, gosh no. But, I can do it – particularly when it’s followed by a shot of tequila, a very large shot of tequila. 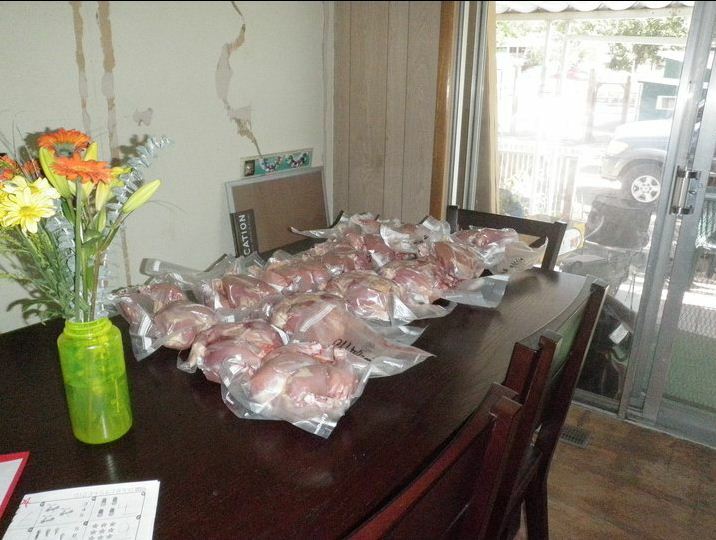 So, we “harvested” most of the meat birds a few weeks back. They were only 6 weeks old, but they averaged 3lbs. a bird. Not to shabby. But, the laying hens are horrible little buggers, and the just kept cannibalizing the remaining meat birds. As of now, we’re done with meat chickens. Of the 25 we ordered, about 18 of them ended up in the freezer. Only one died as a chick, so you can do the math on the cannibalization rate. The fear now is that the laying hens are going to turn on one another or the eggs when they finally start laying. It’s been an interesting experience this time around. 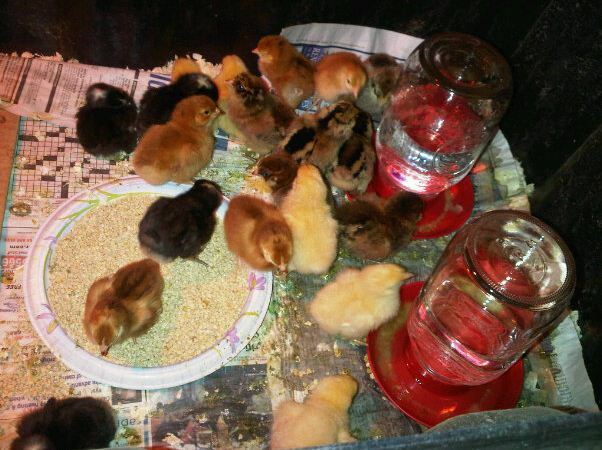 Our first time around, we started with 9 chicks, 2 turned out to be roosters and were culled from the flock. One hen met an untimely demise at the well intentioned hands of Gabe. Only time will tell how many of our laying hens will make it to maturity. Chet and I are dreading the thought of having to cull out the entire flock and start over, but if that’s what happens, then that’s what happens I suppose. 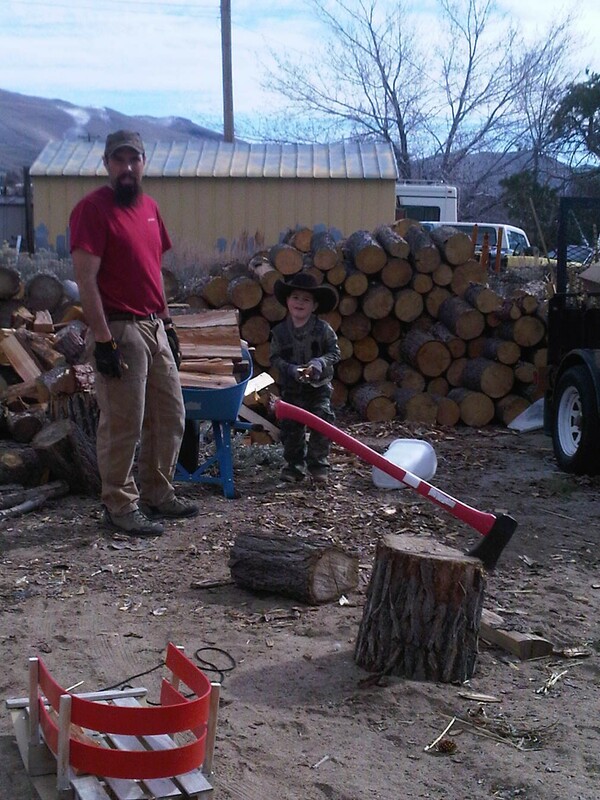 It’s life and learning on the modern homestead.